The Boss, but to all intents and purposes one of the lads! Den established the business from a portable cabin on his parents’ drive in 1981, and has been the local “TV Man” ever since. A fixture on the Wem High Street scene for decades, Mondays-Saturdays, Den likes nothing better than greeting familiar faces and chatting about family and friends, whilst helping to resolve their technical issues and requirements, or demonstrating the features of the latest Panasonic or Bosch product. Den has set the standard for customer care, and is proud to have maintained an excellent reputation for after-sales service, first established by his parents’ watchmaking and jewellery service. Indeed, Den himself is becoming something of an expert on the intricacies of changing watch batteries, the relative merits of Yankee Candles, and the engraving of sports trophies and awards! He admits, if pressed, to a long-standing loyalty to West Ham United (don’t ask), but Tuesday nights at the Montgomery Waters Meadow are his main football passion. Divided loyalties, then, during the FA Cup tie and replay,in January 2018....!! Den's first recruit and right hand man, Pete remains a vital part of the workforce, with an ability to turn his hand to anything! Pete’s technical knowledge of digital reception issues is unsurpassed within the County, and his services are highly sought after by both commercial and domestic clients. Regular customers include property developers, managing agents and housing associations, whilst Pete has also gained a reputation for expertise with community theatres and schools, designing and installing systems to enable live streaming of national events. Foreign reception, requiring the installation of motorised dishes, is another specialist area in which Pete is highly regarded. 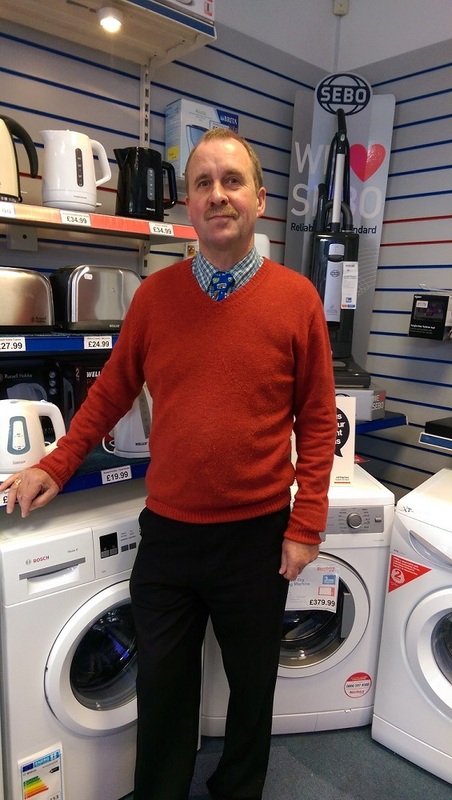 Equally at home in the domestic market, Pete can often be seen undertaking mercy missions to long-standing customers out of hours, anxious to ensure that they don’t miss out on their favourite soap or televised match! 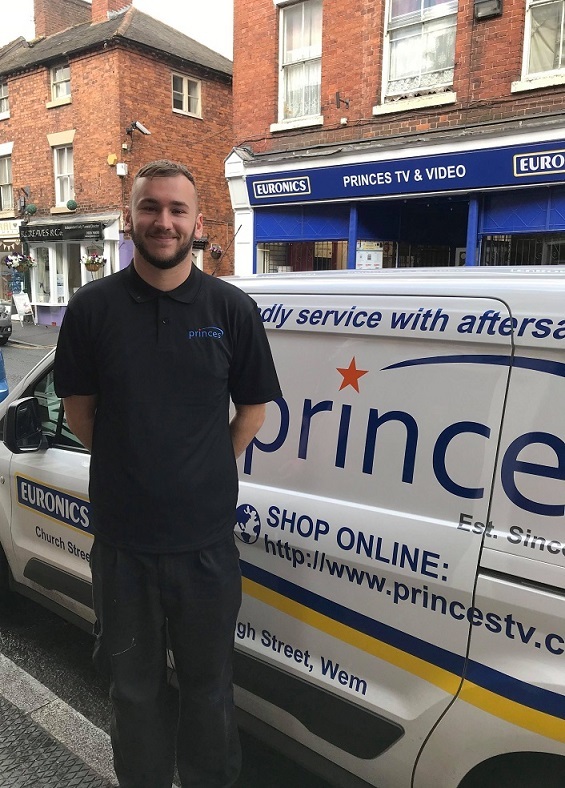 Similarly, if required, Pete will assist the service and installation team, delivering and connecting TVs and White Goods, or carrying out TV and vacuum cleaner repairs in the workshop. Pete is that rare animal, a “jack of all trades, and master of most”! What’s more, for such a clever bloke, his most endearing quality is his modesty and unassuming nature. A family man, Pete spends much of his spare time transporting his youngest daughter to dance events nationwide, often culminating in a car full of trophies on the return journey! Apparently, Pete has been spotted occasionally in Gobowen Club, enjoying a well-deserved pint! Keith is a long-standing member of our team, and has built a loyal fan base throughout our North Shropshire catchment area and beyond, particularly, it would seem, with ladies of a certain age! 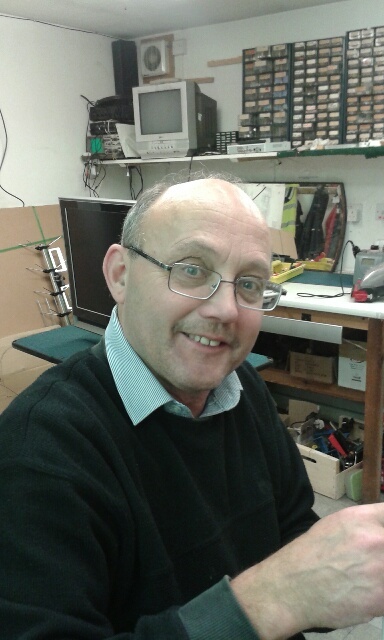 Keith’s ability to explain technical matters in a down to earth and friendly manner, his neat and tidy approach to installations, and his endless patience with those of us who are not so technical, means his services are in great demand. 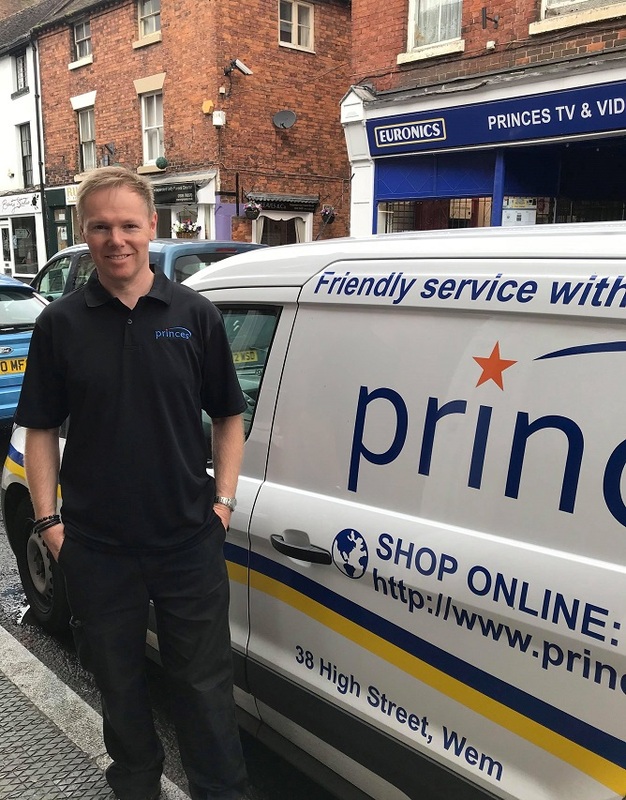 Equally at home setting-up a Smart TV and related internet connections, as when installing an integrated fridge freezer, Keith (or K2 as he is known by colleagues) is a key member of our after-sales team, and has helped to establish and maintain our reputation for customer care. Whixall born and bred, Keith is well-known in local sporting circles, and has an annoying habit of finishing top in the firm’s fantasy football league! Strange, really, given his life-long passion for the red side of Manchester! The proud father of a young and rapidly growing daughter, Keith is getting used to the world of school plays and concerts, sports days and the like, but appears blissfully unaware of the challenges that lie in wait..!! A member of our aerial & satellite team, Steve is experienced in all aspects of digital reception, and is fully trained to work at heights (even though he’s “vertically challenged”)! Steve lives in Oswestry, and provides digital solutions for domestic and commercial customers throughout the County, on jobs including full aerial or satellite installations, the provision of additional points or feeds to enable reception in different rooms, problem solving in the case of poor reception or lost channels, the re-securing of aerials or dishes after storm damage, and a multitude of signal-related issues, both large and small. A guitarist in the excellent Oswestry-based band High ‘n Dry (if you’ve not heard them, do so at your earliest opportunity), Steve thankfully leaves the vocals to other group members, and devotes his own singing talents to the support of the red side of Merseyside, both home and away. Steve is old enough to remember the glory days at Anfield, in those halcyon times when we gathered round a cathode-ray tube television to watch the FA Cup Final, or stayed up late to catch Kenneth Wolstenholme present Match of the Day! A sister-in-law to Dennis, and Paul’s better half, Corrinne has been a stalwart member of the finance & administration team, for longer than she cares to remember! In addition to her accountancy knowledge and expertise, Corrinne demonstrates excellent skills in customer service, both on the phone or at the counter, endless patience with engineers (not renowned for their paperwork skills), organisational abilities required for work scheduling and diary management, and an admirable capability to keep calm when under pressure! In short, Corrinne makes multi-tasking look easy, and this is perhaps a testament to her daily yoga routine (at home, not in the office! ), or is it down to the odd glass of red (at home, not in the office!)? In her leisure time, Corrinne is a keen member of the Fauls Singers, is a fair weather gardener, enjoys local walks and, in conjunction with Paul, is a member of the National Trust, the RSPB and the Shropshire Wildlife Trust. Above all, she enjoys any excuse for family get-togethers! Luke joined the team as an apprentice in 2013, and successfully completed his NVQ in 2014. 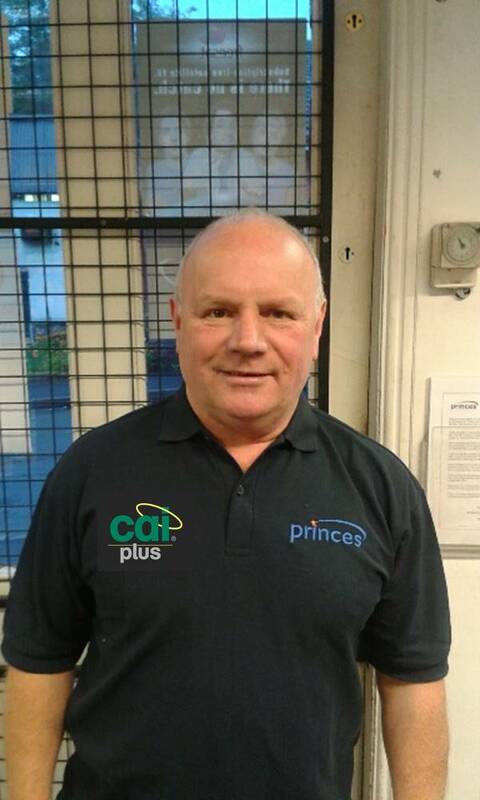 Initially working to Keith’s supervision, as part of the delivery and installation team, Luke quickly impressed both colleagues and customers, with his excellent inter-personal skills and mature personality, and has progressed to a point where he can now carry out one-man jobs on his own. In addition, as a relative youngster, Luke provides a natural instinct for issues surrounding internet connectivity and related matters, so important to the team when installing Smart TVs, Blu-Ray Players and associated items in the modern home. To his immense frustration, Luke is languishing behind Keith in the firm’s fantasy football league, but on balance this is probably beneficial to his career prospects! Like Keith, Luke declares an allegiance to the red side of Manchester. Unlike Keith, he still gets the opportunity to drown his sorrows in Whitchurch night spots, when the occasion demands (and, let’s face it, there have been plenty of those in the last few seasons!). A keen boxing fan, Luke has secured tickets for Anthony Joshua's big fight, but is sitting sufficiently far back not to get caught up in any bloodshed! Den’s brother (the better looking one), and Corrinne’s other half (no comment), Paul is a relative newcomer to the family business, having joined in 2004 after a career in accountancy. Working closely alongside Corrinne, as part of the finance and administration team, Paul has also assumed responsibility (against his better judgement) for the firm’s marketing strategy, which in no small part accounts for his increasing hair loss! Paul has also inherited prime responsibility for the sports awards and trophies side of the business, and is trying manfully to maintain the levels of customer service established by his parents. Customers include Colleges, Schools, Agricultural Societies, Golf Clubs & Societies, Auction Centres and a wide range of Sports & Social Clubs. A keen sportsman in his playing days, Paul’s activities these days are confined to dominoes, but he continues to devote a lot of energy, in kicking every ball, when watching his beloved Shrewsbury Town FC! Treasurer of Prees Cricket & Recreation Club, Paul’s remaining leisure time, alongside Corrinne, is spent walking, gardening & visiting National Trust properties, and he is over half way in his quest to visit all racecourses in the British Isles! Danni is the latest member of the family to join the firm, and by far the youngest! 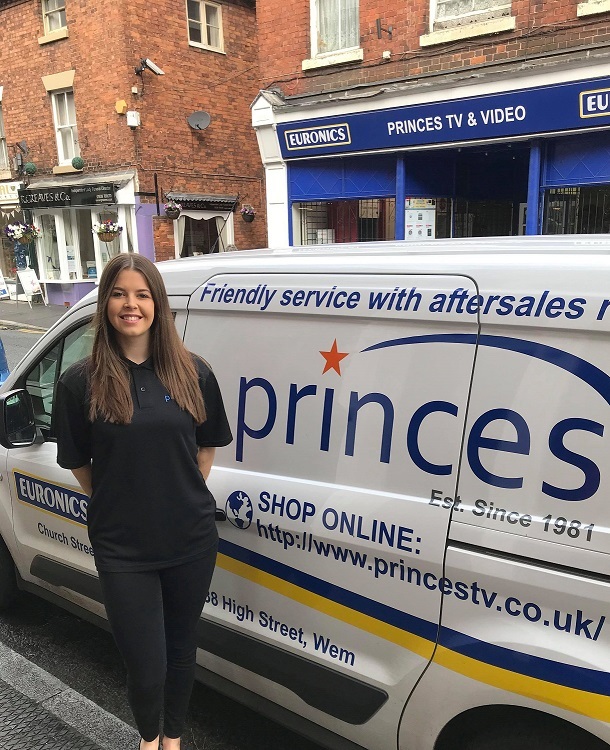 Danni helps Corrinne & Paul with finance & admin duties, but the greater part of her working week is spent at Wem, working alongside Den to provide sales assistance on both the electrical and jewellery & giftware sides of the shop. In addition, Danni plays a key role in developing our online presence, and in promoting the firm through social media, in both cases bringing her youthful knowledge and outlook to the fore! Prior to joining us in January 2016, and having left Adams College, Wem in 2015, Danni worked for a local Hotel & Restaurant, and gained broad experience of a wide range of customer-facing responsibilities. Outside work, Danni regularly attends her local gym, and has renewed her highly promising football career (now with Malpas Ladies), temporarily put on hold whilst working unsociable hours in the hotel industry! Danni is a fan of Liverpool FC, but is far too young to remember the days when the Reds were a footballing force! Mat joined our sales team at Wem in January 2016 and, yes, the spelling is correct (apparently, the Welsh version only employs one "T")! Since graduating in Environmental Chemistry (your guess is as good as mine!) 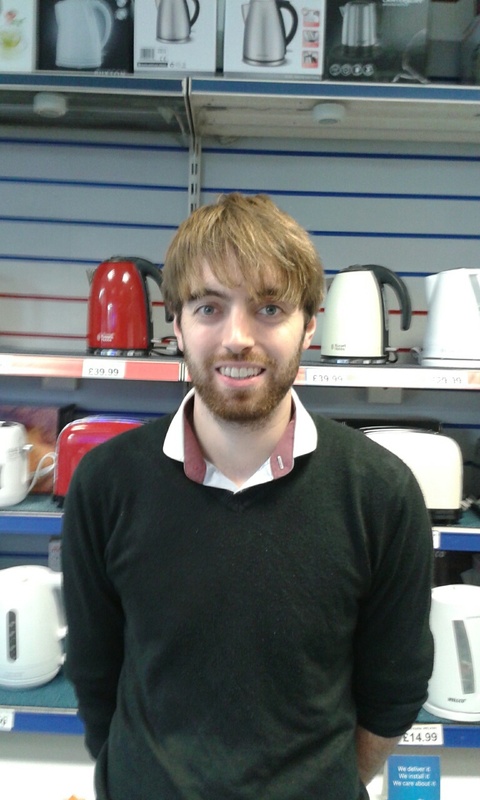 from Lancaster University, Mat has worked in the Licensed Trade, and has acquired highly developed "listening skills"! Mat has a friendly and outgoing personality, ideally suited to a career in independent retail, and his youthful outlook blends nicely with the experience on offer from other members of the team! In addition to his retail duties, Mat helps out on the finance & admin side of the business, and, with a little help from Corrinne & Paul, is making great strides in his efforts to secure an Accountancy qualification. Mat's leisure pursuits centre on a love of the outdoors, and climbing in particular, so we know who to turn to when the aerial & satellite team are hard pressed! The only blemish on Mat's character is a sneaking admiration for Wrexham FC, and no further comment is necessary, other than a long and hard look at our interviewing techniques!! 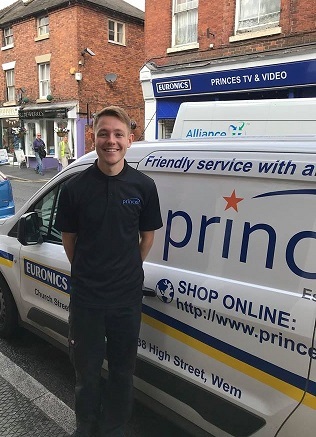 Tom is our newest member of the Princes team joining in July 2018. Tom has integrated into the Prince family within the last few years as Danni's (I'll say better half) - he must be doing something right! Tom has previously completed 5 years at Whitchurch Civic Centre working alongside the Town Council as a Caretaker. Tom's duties included preparing for a variety of events and overall responsibility for the maintenence and monitoring of the building. Within his Caretakers role Tom has become very famliar with the general public, a quality which will most definitely prove useful at Princes amongst many others. Before starting with us Tom completed and passed an introductory course with CAI - The Confederation of Aerial Industries. Despite this being a completely new field of work for Tom, the course has given him an insight into the different tasks he will carry out as he gains a mass of knowledge and experience working alongside Pete. We hope Tom will be a very versatile individual, assisting with service calls, product installation as well as aerial/satellite work. Outside of work Tom is a very keen footballer currently playing for local team Prees FC. Tom has obtained the nickname 'Tommy Goals' - keep an eye on our local newpapers to see how he gets on in the upcoming season! Tom is also a supporter of Liverpool FC strengthening our scouse work force! Keep checking our meet the team page for updated information on all of our employees!